KV-04S optimized AK Scope Mount -New and improved Scope Mount with Picatinny rail for AK Variants. SM-13V Scope Mount with Picatinny rail for AK variants, including Vepr/RPK rifles with side-folding stock. Designed and developed for a successful military contract, Arsenal Inc. continues to offer their premium line of scope mounts to the commercial market. These side-attaching, tension adjustable scope mounts were developed and tested in the toughest conditions to perform without failure. The design is one-piece, CNC precision machined, and each variant is manufactured from aircraft grade aluminum alloy for minimum weight (only 5.76 ounces SM-13V), maximum strength, and low profile. 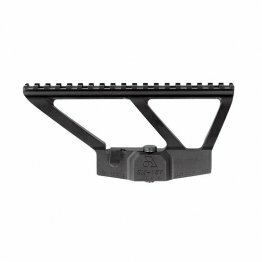 Designed and developed for a successful military contract, Arsenal Inc. continues to offer their premium line of scope mounts to the commercial market. These side-attaching, tension adjustable scope mounts were developed and tested in the toughest conditions to perform without failure. 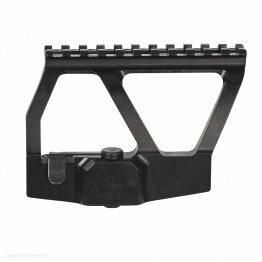 The design is one-piece, CNC precision machined, and each variant is manufactured from aircraft grade aluminum alloy for minimum weight (only 5.76 ounces SM-13), maximum strength, and low profile. Designed and developed for a successful military contract, Arsenal Inc. continues to offer their premium line of scope mounts to the commercial market. These side-attaching, tension adjustable scope mounts were developed and tested in the toughest conditions to perform without failure. The design is one-piece, CNC precision machined, and each variant is manufactured from aircraft grade aluminum alloy for minimum weight (only 4.88 ounces SM-13K), maximum strength, and low profile.